We spent Thanksgiving with my side of the family this year. Thursday morning, we participated in the Drumstick Dash race. Kelsey and I ran the 4.6 mile course while the rest of the family walked the shorter version. Mae enjoyed the stroller ride, but she is still learning about how important it is to keep your mittens on. She had little finger-cicles by the time the race was over. Somehow I only managed to take one photo in the evening but I think it accurately captures the chaos of Thanksgiving with 14 adults and 6 kids all together! 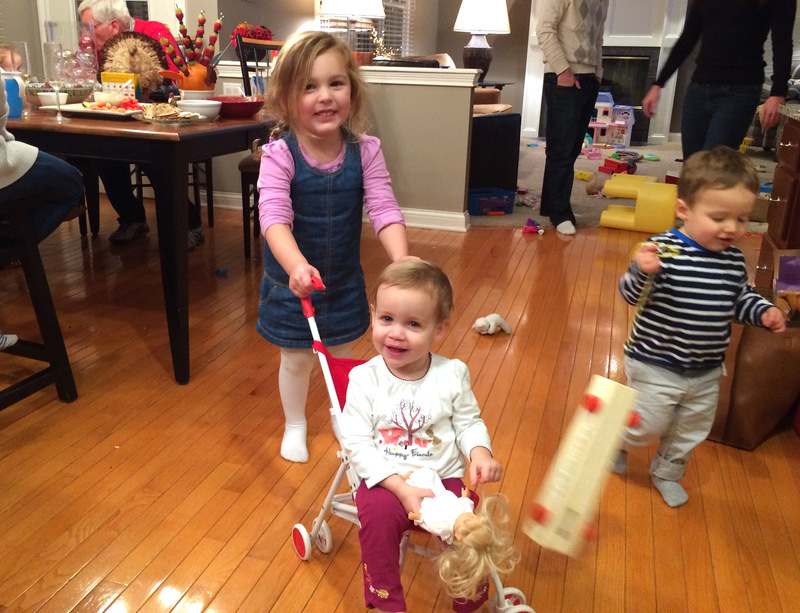 The family room is covered in toys, Henry is dashing around the kitchen with a xylophone, adults are at the table decorating Christmas ornaments, and Kate and Mae are establishing the perfect symbiotic relationship: Kate gets to push a real live baby in the doll stroller while Mae gets a free ride all over the house! Friday afternoon I went shopping with Mom and Kelsey, and on Saturday we all went to pick out the family Christmas tree. We came home Saturday evening and spent Sunday cleaning up the house before going to pick out our own little Christmas tree. We might be putting our house on the market this week, but it's not going to stop me from decorating for Christmas! P.S. Let me know if you're in the market for an adorable 2 bedroom home. Charming! Natural Light! New AC!